Ardith Mae Farm produces superb goat cheeses that possess a flavor, texture, and creaminess you’d be hard-pressed to find on a supermarket shelf. Originally founded in 2006 in Pennsylvania, the farm moved their herd of 60 goats, 4 dogs, and 2 cats to Stuyvesant, NY in 2013. Their animal welfare approved certifications demonstrate their dedication to herd health and happiness and their belief that happy, healthy goats produce great cheese. Bee Hollow Farm is a family owned and operated apiary dedicated to using organic practices. With hives located all over the Hudson Valley, Paul and his team produce a variety of delicious raw and creamed honey. In addition to capturing the nuanced flavors of the Hudson Valley’s flowers in every jar of honey, Bee Hollow’s honeybees are also serving our local ecosystem: pollinating our flowers, vegetables, fruits, and trees. Rock City Mushrooms finds its home at Dog Wood Farm in Old Chatham, NY. The team at Rock City produces indoor-cultivated mushrooms, primarily shiitake and oyster mushrooms while occasionally dabbling in other varieties such as Lion’s Mane and Chestnut. Hilary Corsun and Sara Querbes founded Dog Wood Farm in 2014. The farm includes pastured poultry, chicken eggs, turkeys, and grassfed beef. Hilary has been farming since 2012 and manages both the farm & Good Food Farmers. Although an integral part of the team, Sara helps on the farm part-time while simultaneously pursuing a PhD. Ironwood Farm grows certified organic vegetables and fruits on seven acres of leased land in Ghent, NY. The farm is the effort of three women hoping to achieve more together than apart. Collaboration, cooperation, leading and following are the founding principles of this effort. Ironwood values clean, quality produce that customers are delighted to receive. Founded in 2014, Letterbox Farm is a collectively owned and operated commercial farm in Hudson, NY. It is a young, quickly growing start-up, working to build a diverse and sustainable farm. They tend 64 acres of fields, woods, ravines, and mountainside, just outside downtown Hudson. They raise specialty vegetables, herbs, flowers, pork, chicken, eggs, and rabbit using best practices in animal welfare and organic management. Rock Steady Farm & Flowers is a for-profit farm located in Millerton, NY. They use holistic farming practices to grow high quality vegetables, cut flowers, and herbs. They have diversified customers including a 225 person CSA, floral designers, restaurants, food pantries, social justice non-profits and design for special events. Farmers Sue and Mark Decker believe that, “great cooking starts with great ingredients, and great ingredients start with great soil.” Their goal at Blue Star farm is to grow nutrient dense, flavorful food and doing it with practices that enrich soil and protect the watershed. Blue Star Farm is Certified Naturally Grown, and they proudly refuse to use synthetic fertilizers, herb- and pesticides, or GMOs. The farm is located in Stuyvesant, NY, and they also have fields located in Kinderhook, NY. Hawthorne Valley, established in 1972, is a community of farmers located in Ghent, NY that is dedicated to biodynamic farming practices. Whether it is the loaves of bread coming out of their bakery ovens or the veggies they pull from the ground, Hawthorne Valley Farm is “nurturing the land that nurtures us.” Hawthorne Valley manages roughly 15 acres of vegetables and five hundred acres of land for grazing dairy cows, hay production, and grain production, some of which is used in the farm’s bakery. Juniper Hill Farm is located in Upstate New York and grows certified organic vegetables. Farmers Martin and Christa started (what would become Markisto Farm) in 1988 by planting three acres of blueberry bushes; it just so happened to be their first date. Since then, those three acres of blueberries have become several acres of organic mixed vegetables, flowers, and bedding plants. In addition to Markristo Farm, Martin and Christa, and their children, also work with horses and run Bridlewood Dressage around the corner from the farm. McEnroe Farm is best in the area for their organic compost and potting soils, but they also grow/raise organic certified vegetables, fruits, herbs, beef, lamb, poultry, and naturally raised pork. They never use pesticides, synthetic fertilizer, or GMO seeds. Morningstar Farm includes over sixty acres of certified organic vegetable production in Hudson, NY. The farm is managed by Max Morningstar, Maria Zordan, and Jess Camp who are committed to farming in a holistic and balanced way . They believe that good community and healthy soil are key to a happy life. Roxbury Farm is a four hundred acre family farm located in Claverack, NY founded in 1990. By maintaining a rotation of cover crops and regenerative farming practices the farmers at Roxbury promote good soil health and produce delicious, organically grown vegetables. In addition to their sixty-acre vegetable rotation, Roxbury Farm maintains one hundred acres of hay production and one hundred acres for grazing livestock. Sauerkraut Seth has been making sauerkraut and other fermented vegetables since 1998. He started out on his fermentation journey at Hawthorne Valley Farm, where he started their line of lacto fermented vegetables. 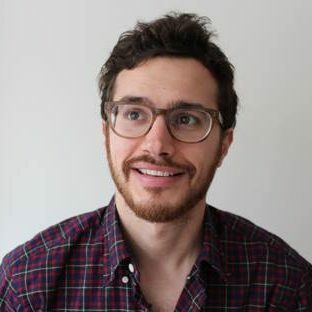 He founded his own line, Seth’s Sauerkraut, in 2012. Sauerkraut Seth’s Famous Sauerkraut is raw, unpasteurized, lacto-fermented, and full of beneficial bacteria. The only ingredients are vegetables and unrefined sea salt. The Farm at Miller’s Crossing provides GFF members with gorgeously dark, and richly sweet maple syrups harvested from trees located on their 200-acre farm in Hudson, NY. The farm is home to three generations of the Cashen family, and farmers Chris and Katie are proud to run the farm Chris’ grandparents bought in the 1950’s. In addition to maple syrup, Chris and Katie grow certified organic vegetables, pastured beef, and pork. Hil founded Good Food Farmers with partner Sara Querbes and several farming peers in 2014 and has managed the endeavor ever since. From deliveries to ordering platforms to bookkeeping and member correspondence, Hil has done it all and keeps on doing. In addition to GFF, Hil and Sara own and operate Dog Wood Farm and Rock City Mushrooms. They are excited to be part of creating a more regenerative food system from farm to table and are grateful to all who choose to participate with them. Hil has always been passionate about the outdoors – from building forts as a kid to going on regular outdoor adventures with pups Harry, Tate, and Scout. Their passion for food and farming arose out of the realization and first-hand experience from West Africa to the Hudson Valley that agriculture has tremendous power to help shape the future – to restore our environment, to fight for social justice, and to build resilient local economies. Hil brings these passions to work each and every day and is full of hope for what the future could look like. Dan joined the GFF team in June 2017 and has been instrumental in operations ever since. You may recognize him knocking on your door each week for deliveries, though he also works hard behind the scenes organizing logistics and packing out orders. 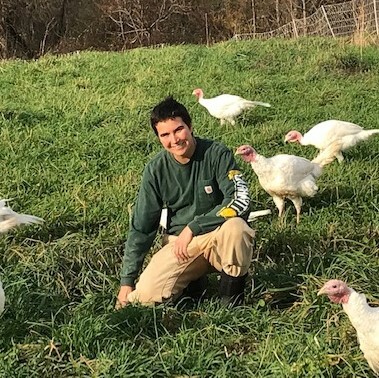 In addition to his work with GFF, Dan is part of the team at Dog Wood Farm and Rock City Mushrooms where he helps tend to the grassfed beef cows, pastured poultry, and indoor-cultivated mushrooms. There is no task too small or problem too big that Dan isn’t willing to take on. His passion for building community and spreading joy through food is what drives him to help make GFF – in his words – “awesome”. Dan lives with his wife Vienna and their two dogs, Abigail and Clover, in a 220 square-foot tiny house that they built. His two greatest passions in life are music and the outdoors; if he is not at home fiddling with a guitar then you will most certainly find him hiking a trail to the nearest peak. 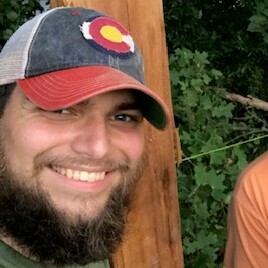 Zach joined Good Food Farmers in January of 2019 and works to make sure our story is being told and that folks who share our passion for good food can find and join us. He is originally from the Boston area, and worked at a few tech start-ups before he made the plunge into agriculture several years ago. He sincerely believes that good food can save the world, and is thrilled to be a part of an organization that is trying to change the food system for the better. In addition to helping grow Good Food Farmers, he grows vegetables at Dog Wood Farm. When asked what his favorite crop to grow is, he will quickly tell you: “Cover crops!” Cover crops are plants grown to “feed the soil,” and Zach is passionate about growing great vegetables by improving the soil. He’s also passionate about draft power on the farm, and can’t wait to share pictures of his team of oxen with you all on our social media accounts. When he’s not farming, Zach is most likely lying on the floor with his dogs, learning to play mandolin, hiking, or trying to get his partner, Meg, to play a complicated board game with him.